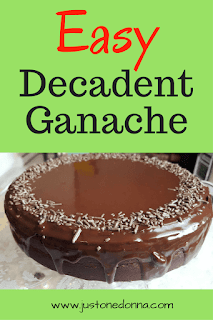 Chocolate ganache is one of those things that sounds intimidating but will surprise you because it is so easy to make. I especially love to use it as a cake topping when I am in a hurry. It takes very little time and looks impressive. 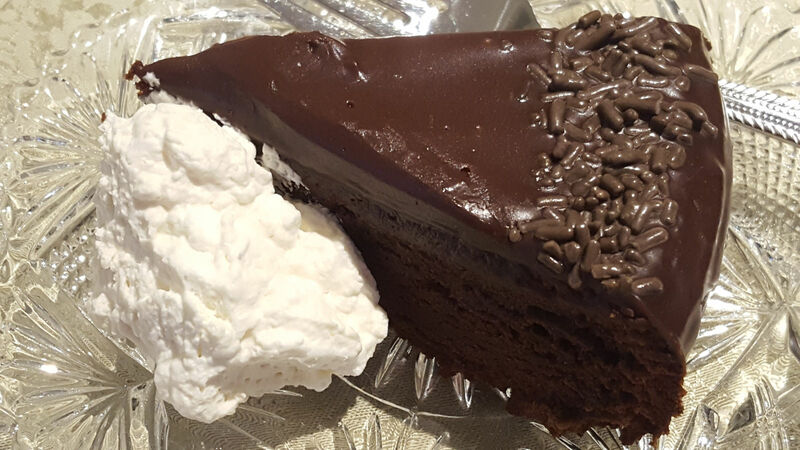 A chocolate cake topped with ganache is a delicious treat for the chocolate lovers in your life. The chocolate ganache topping on this single-layer chocolate cake was so shiny it was like a mirror on top of the cake. 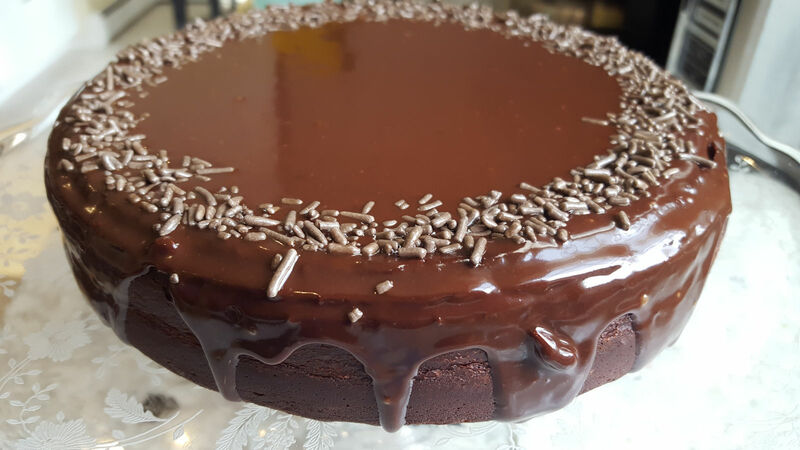 Don't you love how the ganache drips down the side of the cake? I added some chocolate sprinkles around the edge of the cake for a little texture, but icing this cake with ganache was as easy as one-two-three. Ganache is a two-ingredient topping. Yes, that's all. You'll need chocolate and heavy cream in a one-to-one ratio for a topping. I make my ganache super easy by using chocolate chips. Most often I'll choose semi-sweet chocolate chips but choose your favorite type of chocolate. You can also use a block of chocolate that you cut into small pieces for easy melting. I find that the chocolate chips melt easily and produce a perfect, shiny topping every time. The one-to-one ratio of chocolate to cream is perfect for topping cakes and cheesecakes or drizzling over your favorite ice cream. A two-to-one ratio of chocolate to heavy cream will cream a much thicker consistency that is perfect as a filling between layers of cake or rolled into truffles. 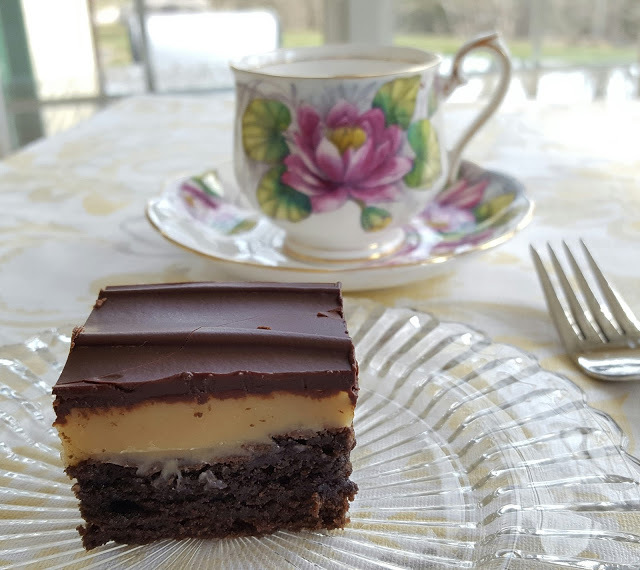 I used a two-to-one ratio for the topping on these Caramel and Ganache-Topped Brownies. 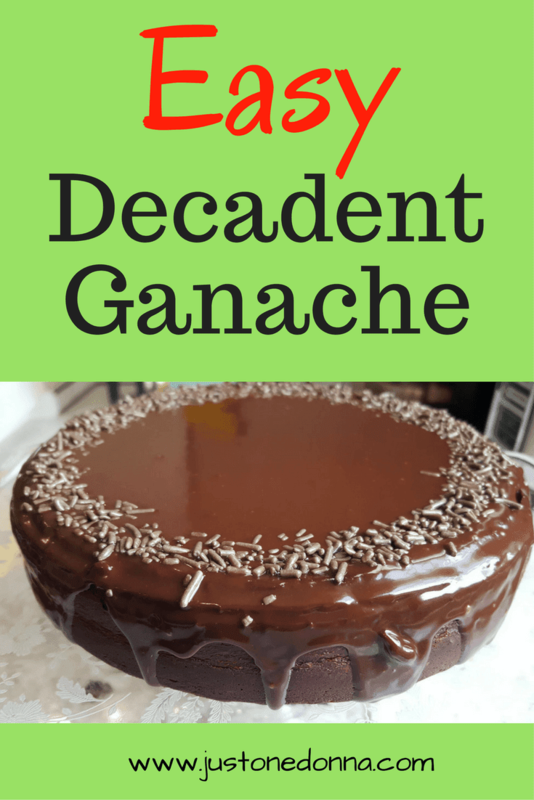 Once you start making ganache you'll find many ways to use it in your desserts. It's perfect for holiday desserts treats. Heat the heavy cream in a small pot over medium heat. Bring the cream to a boil. The cream will expand and quickly boil over so you'll want to watch it carefully. Place the chocolate chips in a heat safe bowl. Pour the hot cream over the chocolate. Stir gently, until all the chocolate is melted and you have a shiny, smooth topping. Cool the ganache for about ten to fifteen minutes to a still pourable, but spreadable consistency. Pour the ganache into the center of your cake and spread to the edges with an offset spatula or the back of a spoon. Allow the ganache to drip over the edge of the cake. The ganache will set as it cools completely. I am sharing these affiliate links for your convenience. When you shop using these links I receive a small compensation that supports publishing this blog. You'll want a kitchen scale to easily weigh your chocolate when making the ganache. This is the scale I use. An offset spatula makes it easy to spread the ganache with little effort. This small size is very handy. Thanks for sharing this post on social media. Your Facebook, Twitter, and Pinterest shares are very much appreciated.